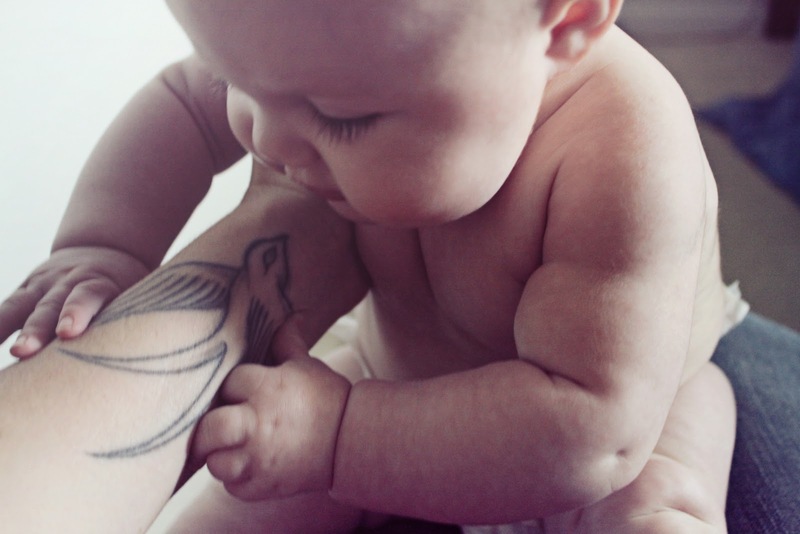 A certain little lady has been pretty fascinated with her mama and papas' tattoos lately..
She's always grabbing at our hands and arms and pretty much anything in front of her, as most babies do. But I'm starting to notice that with me (since D's arms are covered so she has no choice but to look at them) she really does hone in on the tattoos on my wrists. It's probably just because they stand out against a blank arm, but I like to think that it's because she loves them. This got me thinking about why I love them, and why I get them. My love affair with tattoos has intensified over the years. I used to like them small and balanced on my body. I get one on one side? I have to get one on the other. Then I became obsessed with having one off balance. I used to only want black and gray tattoos. I thought they were sleek and classic. Now I'm hell-bent on having color done. I understand why this is the reason a lot of people are hesitant to get tattoos, because how could you get something so permanent when you're ever changing? Here's what.. The one thing that I never changed my mind about was that I love them. Sure, I've got a tattoo (or maybe 2) that I don't exactly love like I used to but they are a part of my journey. A reminder of the good and the bad. Some people might not like that. But when I look at what was bad, and smile because I moved past that, the tattoo only becomes a reminder of how much stronger I am, and how much further I've come as a person. To me, that's beautiful. I've never been one of those "I only have tattoos that meeeean something to me" people because I think that's the most ridiculous thing I've ever heard. If you get a tattoo for no other reason than the simple fact that you love it, doesn't that mean something? Don't your interests and surroundings mean something to you? Yes, every tattoo has a meaning even if it's of a dinosaur eating pizza out of the box and watching tv. Clearly that person has a sense of humor, is some sort of comedian in their own right, and that's part of who they are, what they like, and is full of meaning. Some people see tattoos as "bad"- you have em? You look bad, do bad, are bad. Well guess what? D has tons and he's one of the kindest people I know, and I don't think Hitler had any if you get my drift. People complicate it, stress over it and analyze it but at the end of the day, they're just another form of art. The only difference is your canvas, and I think people just happen to be the most beautiful canvas of them all. With all that being said. I'm so excited to finally be getting my newest and truest one very soon. A tattoo in honor of Rowan, and to mark my newest journey through motherhood. My appt is on March 7th and I can't wait for you all to see it! I've been thinking it up since the beginning of the pregnancy and it's beautiful and perfect for her and I know it will be her very favorite of mine. I daydream about the day she's old enough to ask about it and understand when I tell her it's story. So in honor of all things tattooed and beautiful, I wanted to share some links to the blogs of just a few of my favorite tattooed ladies. yours are beautiful! at least from what i've seen. That is how I feel about my tattoos too... Even the ones that aren't quite "me" anymore were me at one point. I also don't place too much meaning in my tattoos. I mean obviously there is a connection, I chose to put that image on my body, but aethetic reasons are not necessarily superficial! Aww I love this post! I'm the same way about tattoos meaning things. A bunch of mine are just because I like the way they look. Actually, most of them! haha. My hubby even has a unicorn on his ankle...and a couple other "joke" tattoos with his friends. Loving the dino eating pizza!! :-P That would make a very fun tattoo. I used to be the same way you were about balancing tattoos, then not balancing tattoos, and black, grey, and white tattoos. Now I want them big, bold, and vibrant! I have a couple tattoos that I'm not so in love with, but they are me and I am proud of them. I used to worry about what others would think, but I honestly don't care. Its my body and I will decorate it as I like. I have loved this post!! And I will say that you are one of my favorite tattooed ladies! I was one of the people who thought that tattoos had to "mean" something but I think I always found myself slamming meanings into them rather than, as you said, allowing them to "mean" that moment in your life. I've kind of let it go over time and I love it. So thanks, again! Lovely blog post. :) I like this post. It's so cute how Ro focuses on them. I wonder what Elliot will think of my hubs'. My husband has seven tattoos! I only have one though, but I know of three that I for sure want to get sometime. The question is, when? I LOVE this post. I don't have any tats (i don't have the guts ;D) but i LOVE them. I love what you said about Hitler! lol So true!!! i think the EXACT same thing about my tattoos. some of them i'm not in love with anymore, but they are a part of who i am, symbolic of my journey, my life, my adventures through this world. awesome post, my dear! i am obsessed with tattoos. i love when stella grabs at my cupcake on the inside of my bicep-i think it is her favorite. I just stumbled upon your blog via Sometimes Sweet. Your family is absolutely adorable and you are so pretty! Thanks for sharing such adorable pictures of your baby! luv luv your post today! Your thoughts on a tattoo on each side to balance things out made me think of my own..for some reason mine are all on my right side..none on my left..but it makes me feel evened out..lol..strange hey! I love how everyone just "knows" where they need to put their ink. Thanks for all the links..going to pay the ladies a visit! I love your sparrow tattoo on your arm. And I love that you are getting a tattoo in honor of your sweet baby! After I have my baby I plan on getting part of a half sleeve done in honor of my little baby girl Lily (Lillies down my shoulder) and my husbands vows written down my arm. I agree... I love tattoos and I don't regret getting them at all! Again such a beautiful post. I love the way you talk about the tattoos and bring so much more to them, beauty, stillness, art, gentlenes, so many things that people just don't see with tattoos. I am not a fan of tattoos but that doesn't mean I hate them. I actually think the opposite I think they are very beautiful and Love to see them. But I also think that more and more people are getting them and the thoughts of tattoos being something bad is more older people, previous generations. I really love this post, is it alright if I post a link to it on twitter? You're such a beautiful soul. Loved this post. LOVE! thank you for the little shout-out and for introducting me to some sweeeeet and lovely new blogs! XOXOXO!!! i think you definitely hit what i've been thinking spot on. mostly the part where people ask "why did you get that tattoo?" or "what does that mean to you?" it bugs me! i absolutely don't think that when you get a tattoo it has to have a deep meaning. i personally think the "just because" are the most interesting. and i just found your blog. love it!